Minority Rules: Who Gets To Claim Status As A Person Of Color? 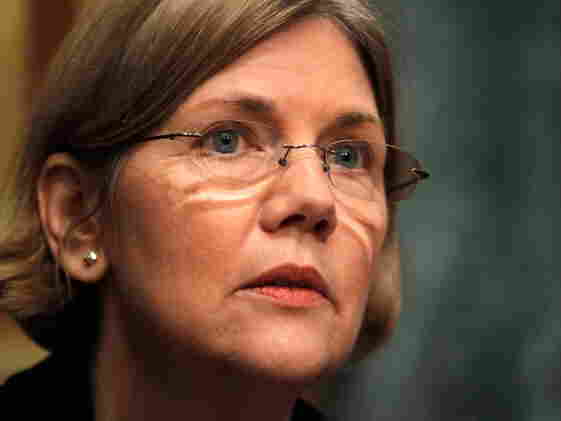 : It's All Politics U.S. Senate candidate Elizabeth Warren's claims of Native American heritage seem uneasy to swallow. But why? What does it take to be considered an ethnic minority, and what does the controversy say about the way we judge ethnic backgrounds? Massachusetts Senate candidate Elizabeth Warren is shown here attending a 2010 Capitol Hill hearing on the Troubled Asset Relief Program. Massachusetts Democratic Senate candidate Elizabeth Warren isn't backing down from her claim of Native American ancestry, despite the apparent lack of primary documents proving that she's 1/32nd Cherokee. The controversy surrounding Warren's heritage led us to wonder — how much of a racial or ethnic heritage constitutes minority status? Should percentages of a bloodline matter at all? The Census Bureau lets individuals self-identify. Since the 2000 count, people have been permitted to check multiple boxes for race or ethnicity. But history has shown a wide variance in how people of different backgrounds come to be identified as part of ethnic groups. Notably, the issue of racial identity surfaced recently following the fatal shooting of Florida teenager Trayvon Martin, who was African-American. The boy's shooter, George Zimmerman, initially was identified as white, prompting accusations that he racially profiled Martin. Once it was reported that Zimmerman's mother is Latino and his father is white, he was identified as Hispanic and later as white Hispanic. The early 20th century's "one-drop rule" stated that a person with a single drop of African blood in their lineage was considered black, and the classification was used for discriminatory purposes. "This is the story of the tragic mulatto, right? A person who looks totally white was denigrated as a black person," said Anne Cheng, a professor who specializes in race studies at Princeton University. For generations, people have used their mixed-race background to gain advantages in society. Many of those who were half black, for instance, "passed" for white to avoid discrimination. Today, some people have flipped the "one-drop rule" to claim minority status to try to gain perceived advantages in scholarships, college admission and in the workplace. In response, the Coalition of Bar Associations of Color passed a resolution last year urging law schools to treat the practice of "box checking" as "academic ethnic fraud." So the question of membership in a distinct racial or ethnic group matters to those both inside and outside the groups. But the ways we define minority status are as diverse as the people defining themselves. Among the 400-plus federally recognized Native American tribes in the U.S., questions about the authenticity of people's tribal memberships have led to power struggles and in some cases expulsions. "It's an answer all over the place," said Michael Woestehoff of the National Indian Gaming Association. Woestehoff said for Navajo Nation membership, a person must have one-quarter or more Navajo blood. "For elections and holding office, my tribe requires you to speak fluent Navajo." "For those who applied after 1963, the standards went up to 1/16. Bill John Baker, principal chief of the Cherokee Nation — an umbrella group which includes the Eastern Cherokee — is 1/32 Cherokee, which was the subject of a minor controversy prior to his election, but obviously not a deal-breaker. In other words, without wading too deeply into ongoing debates within the Native American community, Warren could make a fairly legitimate claim to the title." Different tribes handle the question differently, especially when it comes to health care and education benefits tribe members receive and how tribes use profits from tribal gaming businesses, which generate an average of $26 billion in revenue a year. For the Salt River tribe of Phoenix, which runs two casinos in Arizona, criteria for membership require at least a quarter Indian blood from the Pima or Maricopa lines. Membership then affords a person the opportunity to sit on the board that regulates the casinos and how gaming revenue is spent. "If you're going to state you're Native American, where does that bloodline come from?" said Janet Johnson, director of the Salt River Tribe. "The proof is important. If they have the proof that they have some lineage, then it's their right [to be a member]." That proof of Warren's heritage is now in question, but Warren has said she remains "proud" of it. Her campaign strategist says Warren learned about her background "through conversations with her grandparents, her parents and her aunts and uncles." By some people's definitions of racial identity, that's enough to classify her as Native American. But personal preferences and percentage don't seem to matter as much as perception. For the columnists making "warpath" and "wampum" jokes about Warren's claims of heritage, the problem may be that she simply "looks white." "It really is revealing how fraught racial identity is to America, and how uncomfortable we become when the visual is not telling," said Cheng. "Even though it doesn't seem like the kind of racial profiling that we think of historically, [the Warren issue] seems to suggest we are in the exact same place as we used to be." Cheng and others warn that judging race or ethnicity by appearances is increasingly difficult in a time when mixed-race marriages and immigration from a wider swath of foreign countries is more common. "The problem is that there's this disconnect between the way we tend to define these things and the reality, which is that race is socially constructed," said Camille Charles, a professor of sociology at University of Pennsylvania and author of Won't You Be My Neighbor: Race, Class and Residence in Los Angeles. "We have tried to make race biologically determined, so we use blood and genes and those sorts of things ... [but] if you think of the assimilation process, groups who look distinct are the least assimilated in terms of persistence of prejudice. We've paid attention to skin color." Charles argues that ethnic heritage should be determined by each individual, the way the Census allows. But many people's self-identification remains limited by their skin color, which influences the perceptions of others. As we've seen with Warren, lack of primary proof combined with public perceptions can be politically problematic.